Horses are animals that live in prevalence on Earth and seemingly scarcely in the Mushroom Kingdom, which appear infrequently in the Mario franchise. Horses made their first Mario game appearance in Mario & Sonic at the London 2012 Olympic Games. There is a large variety of horses in the game, such as brown, bright brown, and white. The Equestrian event is set in Greenwich Park, where the horses are found. They can be ridden by playable characters the game. At the beginning of Equestrian, when a GO! appears on the screen, the player can swing the Wii Remote for a Starting Dash. The player has to hold the Wii Remote on its side and move up and down as if they were reins to speed up. The player needs to slow down and angle their Remote to steer around corners before galloping up to a fence and leaping over it. Equestrian is known to have ten fences, which a horse needs to jump over. If the player misses a single fence, he or she will lose the game. When the player is about to finish the Equestrian event, the Horse may speed up when the player keeps on shaking the Wii Remote. The Horses are also available in the Dream Events; the Dream Equestrian event takes place in Moo Moo Meadows from Mario Kart Wii. The event needs four players who ride their horses, and help transport the seven Yoshi Eggs on a cart at the goal of the minigame. Sometimes, arrows to show the direction where the players should go to will appear, and the Horse will move if the players hold the Wii Remote sideways and shake it in the right direction. Sometimes the cart tips over and the players have to hold the Wii Remote in the right direction to get the balance back, especially when a Chain Chomp chases after them on a bridge. The horses always have to dodge things thrown at them, including the barrels behind them, a Magikoopa's magic attacks, or what's laying around. If a horse is injured, the cart will lose a Yoshi Egg. Boost panels can help the horses increase their speed. At times the horses are at cliffs, the player needs to press the button to make them jump. If the characters make it with Yoshi Eggs, different colored Yoshis hatch and they will complete the event. However they lose the event if all the Yoshi Eggs have disappeared from the cart. 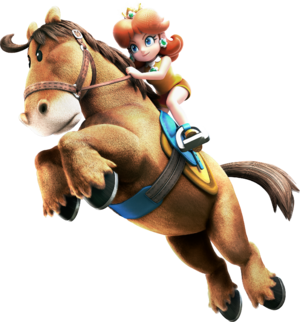 In the Nintendo 3DS version of the game, only female characters can ride horses. Horses return in Equestrian in both versions of Mario & Sonic at the Rio 2016 Olympic Games, serving the same purpose as Mario & Sonic at the London 2012 Olympic Games. They also appear in Equestrian Plus in the Nintendo 3DS version. In both versions, Larry Koopa expresses a keen interest in the Equestrian event and horses. 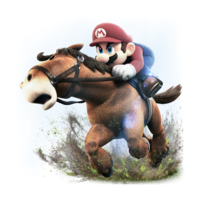 Horses appear in the Horse Racing sport of the Mario Sports Superstars game. Here, players take care of their horses to better their mood and increase their bond with them. Prior to playing horse racing, players can choose their horse's gender, as well as the type of horse they wish to choose, from a pool of four horse types: balance, speed, power, and technique, and they all come with different designs and colors with different stats. Players can also unlock accessories for their horses to wear, such as saddles, bridles, and hats. Alternatively, a horse can be selected from a selection of "guest" horses (which increases upon winning tournament cups). Also, the horse's stats change slightly depending on the play type of the rider. This page was last edited on February 9, 2019, at 20:08.